The first of the veg planted in my veggie beds – predominantly the root veg – are all pretty much finished now and I’ve harvested the last of the parsnips, turnips and swedes and culled some of the older veg that is now going to seed. All rich fodder for my compost bins. The biggest lesson so far is not to over-plant, although it is so tempting with so many plants, limited space and the joint fears that a lot may die off or I will want to harvest lots of it, not mentioning the pain of thinning out successful seedlings. I have a few different beds I can use now so I’m trying to be a little more disciplined with planting. And not planting everything at once. the wide range of cherry tomatoes which had all the neighbours intrigued with both the range of colours and shapes. These grew well against the back wall and I intend to repeat again this year. I already have a few planted in a trough I moved from Sydney. They were 100% consumed last year, including being used for semi-dried preserving. radishes – I love radishes and always buy them when they are in season. These little ruby jewels are lucky to make it to the kitchen (a bit like the cherry tomatoes) and are dusted off and eaten on the spot. I’ve already replanted some of the longer French Breakfast variety and intend to also do the smaller round traditional variety. Cucumbers and zucchinis – a little mixed with how well I grew them but enough plants survived me to provide wonderful veg that was quickly consumed. Zucchinis do take up so much space, though. Broad Beans – I had a post drafted questioning whether the broad beans were worth planting given the space they take up (and they can look messy when I prefer better behaved plants). 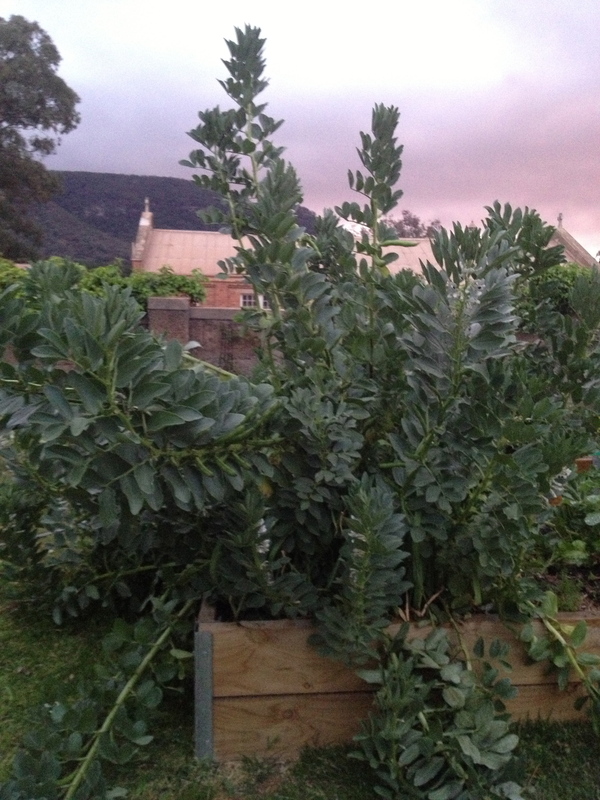 I now have no doubt that broad beans are wonderful and worth their space in the garden. I have had them in three spots, including in the raised veg bed where they are causing havoc. I deliberately bought the Dwarf variety so they wouldn’t tower. As you can see above, I was mistaken. I now believe that “dwarf” refers to the bean size, not the plant size. Anyway, all the plants have heavily rewarded me with bountiful and beautiful beans that have supplemented many a meal and are great as a salad, added to a risotto or as today, stir fried with the sugar snaps with a little oyster and soy sauce. All is forgiven and they will become a Convent staple in the garden. 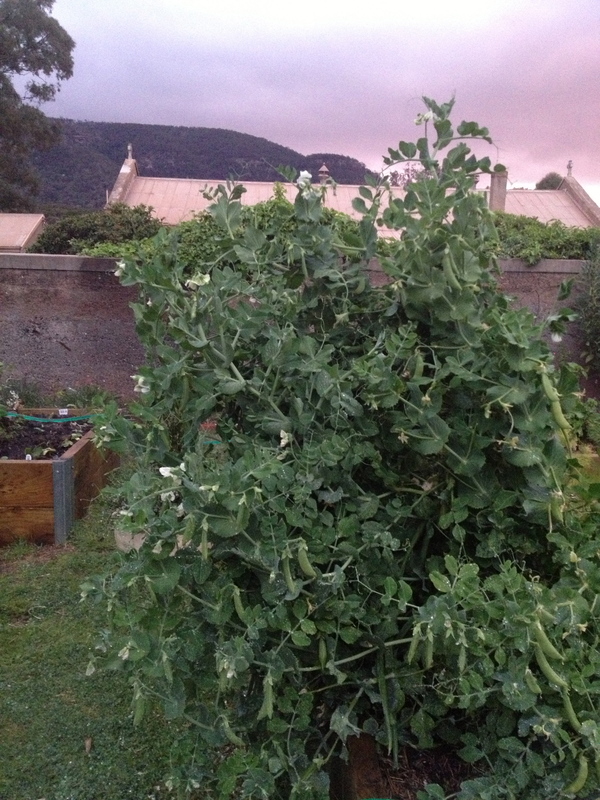 Sugar Snap Peas – I was told by a local that the only thing that grows better than weeds in Kandos is snow peas. On that note, I planted snow peas, normal peas and sugar snaps – all have been great and provide on-the-spot garden snacks for visitors. The sugar snaps, however have been outstanding in both taste and cropping, with the plants continually heavily producing, despite constant picking. The current plantings, which I am being more disciplined with and pacing myself, including cleaning out beds, and supplementing with new compost, organic fertilisers and mulching (and thanks to Flash and Smokey for all the horse manure) before planting. New additions include: the initial cherry tomatoes, two larger tomato varieties, capsicum, cucumbers, chillies and zucchinis. A couple of passionfruit will supplement the two vines that seem to have successfully survived. I already have in asparagus, onions, rhubarb and the nine bags of potatoes which are now full to the top with sugar cane mulch and healthy potato plants still peeping out. Mixed lettuces will be a must. It’s an exciting time to be here (almost permanently) so I can take care of the garden properly and watch the daily changes. I’m also keen to have an interesting display for visitors for the Kandos Gardens Fair. One of the great pleasures is to plan each meal around what the garden currently has to offer. Last night it was Smoked Trout Pie which incorporated my fennel, dill and lemons, as well as using breadcrumbs from homemade bread. Small steps, but so rewarding.